By 1791, mounting divisions among revolutionary factions and the threat of a counter-revolution led by King Louis XVI (r. 1774-92) resulted in further escalations of violence. 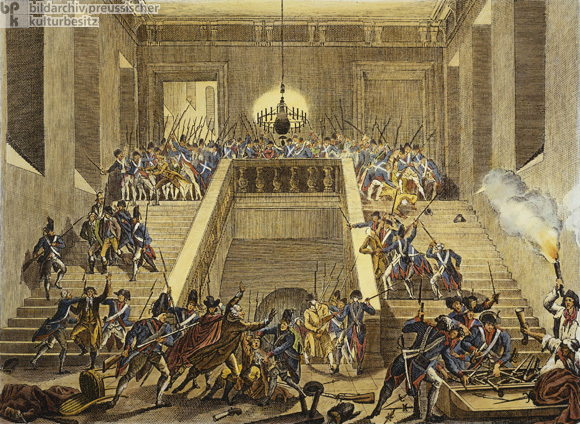 The image below shows the violent disarming of the nobility on February 28, 1791, in the Palace of the Tuileries, where Louis had lived since 1790. On August 10, 1792, a mob of Parisians stormed the Tuileries and deposed the king. He was executed the following year. As populist urban violence rose, foreign enthusiasm for the revolution diminished significantly. Colored copperplate engraving by Anton Otto (?) after a drawing by Jean Louis Prieur (? ), undated.